A new photo of Duchess Kate has finally emerged. When I heard the Cambridge's were staying at Birkhall with The Queen, I had thought it would be a while before we would see any new photos. However the Duchess was spotted shopping with her family in Hungerford, Berkshire near her parents home in Bucklebery on September 4. Better late than never :) Locals were left shocked when they spotted Kate in the local shops including Hungerford arcade and Hungerford emporium. I am a little skeptical about these photos being taken on September 4th as in the first photo it looks more like December and in the background there appears to be a Christmas tree. Kate's style has changed in the past year and this look is more in keeping with her look pre wedding. Am I correct? Nonetheless the outfit is fabulous and definitely worth documenting. Duchess Kate looks effortlessly chic in dark skinny jeans, a black wrap sweater, black boots and a gorgeous grey handbag. Her hair looks amazing too, I think she has lightened it. Kate's engagement ring really stands out in this photo too. With Kate's fashion sense it is no surprising she has been voted 'Queen of the high street' by 3,000 UK voters beating singer Cheryl Cole and sister Pippa to the title. UPDATE: As the quality of the photos are not wonderful, It has been difficult to identify the exact items the Duchess is wearing. This Jigsaw cardigan for sale at John Lewis (A favourite of Kate's) for £96 seems quite close. You will notice the tie effect and the sleeves are the same. 'The cost jigsaw cardigan has a luxurious angora cashmere mix fabric, and a chic style that can be worn for smart or casual outfits. It has a relaxed shape with open neckline and tie belt to add shape'. As for Kate's jeans we know she is a fan of J Brand. These ones looks similar to the dark grey skinny jeans Kate wore. These jeans are the 811 mid rise skinny leg. 'Fitted from hip to ankle with a slightly higher rise, the mid rise skinny leg is your go to classic. The super tight fit slips right into boots with no folding or rolling'. Duchess Kate has famously been a fan of black suede boots since her days in St. Andrew University. If you have a pair of black suede boots flat, heel or wedge they will complete this look easily if you are trying to emulate Kate's look. Iv'e chosen two from a couple of Kate's favourite stores. These ones are the LK Bennett Belsize boots. 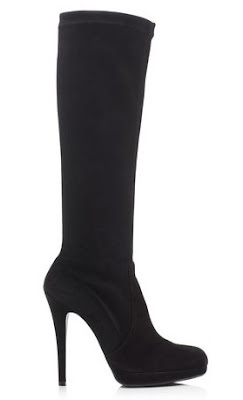 These JohnLewis Seine Knee high black boots were featured in Edition magazine. They are currently selling for £140. In other Kate news, The Cambridges were spotted grouse hunting with Charles and Camilla in Scotland. No photos have emerged yet although I think it may be possible we will see something soon! It's good to hear William and Kate are enjoying a holiday with their family! I will update if these is any official confirmation regarding the exact date the photos were taken! great to see new pics of kate. tho i agreee with you when you questions their date. it's not the return to boots which makes me question the date; it's the soft fullness in her face (and her bum!) which she lost as the wedding approached; last i saw her face it did not have that softness and looked a little gaunt - you can cut bread with that sharp jawline! i hope these are recent pics because i would loveit if she has gained weight and regained her pretty cheeks and softness to her face. I'm inclined to completely agree with you Alpa. I have looked into it quite a bit and from what I can gather these were taken somewhere between last Nov-Jan. Her face has become much thinner since the engagement, I didn't truly notice it until I compared these pics to recent ones. Duchess Kate was spotted shopping in Anglesey today (Sept 15) Hopefully we shall see some new photos soon! Charlotte, I know this is an old post but I had to tell you - I found these pictures through a photo agency and it looks like they were taken on December 13, 2010 in London and were inputted on the site in September, which may have caused the confusion. Check it out - looks like a spot of Christmas shopping King's Rd. Thank you so much Sarah, I had always wondered when they were taken!